There may be no end to the number of digital photos you can snap, but eventually your photo collection will overtake the oh-so finite amount of hard drive space you currently have. Fortunately, the options for large external storage upgrades are plentiful. One candidate worthy of consideration is the Maxtor OneTouch 4 Plus (750GB). Although blemished by uneven performance and software incompatibilities, the drive nonetheless provides an attractive solution for your storage needs. This black ziggurat-shaped drive is tapered toward the top, with scooped-in aluminum sides that serve as heat sinks for the hard drive mechanism within—the indentations on the sides also make for an easy grip when moving the unit. All connections—two FireWire 400 ports, a mini-USB connector, and the power jack—are positioned at the widest part of the case, at the bottom. The drive features a programmable push button on the front that can be used to trigger an immediate backup using the included Maxtor Manager software. In practice, we discovered that the version of software that came with the drive was not compatible with Leopard. Maxtor is currently updating the software to rectify the situation, and the new version is in beta now. Maxtor Manager offers some other useful features beyond its backup function, such as software encryption and password protection of the drive. In our performance testing, we found the Maxtor to be generally a middling performer in terms of speed, compared to the other drives we’ve looked at recently. One disappointment in this area: the performance of the Maxtor OneTouch’s FireWire 400 port actually lagged that of its USB port in the Duplicate File and Low Memory tests, which is atypical in a hard drive. Seagate, Maxtor’s parent company, attributes the test results to new Leopard drivers that have improved the transfer rate of USB 2.0. While the drive no speed demon, the Maxtor OneTouch 4 Plus’s attractive styling and encryption features make it worthy of consideration. Leopard’s built-in Time Machine backup feature may take some of the luster off the backup software included with this drive, but push-button backups on demand are available if you need them. 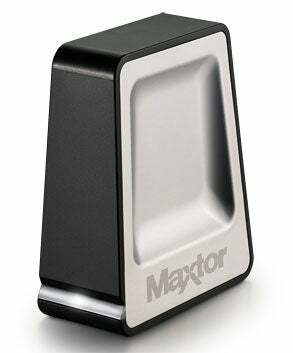 Maxtor also offers the drive in 250GB and 500GB capacities.